I thought I’d share just a bit about what I’m working on at the moment. Not personally but professionally. I work at an animation studio in Southern California ~ and to make a very long story short we’re working on a soon-to-be released Christian cartoon series for kids called Theo. I do a very small amount of this-and-that type of work on the series and on the website but my main contribution is a segment (typically one half of the entire show length!) called ‘Shoebox Bible Theatre’. In the Theo cartoon series the main character, Theo, puts around his enviable English cottage with two mice in tow and discourses about theological concepts for little ones (not mice but children rather) . It’s actually quite handsome quality-wise ~~ we’ve had a lot of top shelf animators and other artists working on this project. To further illustrate his point in each episode (except the bonus episode ‘Good News’) Theo pulls out a ‘magical’ type shoebox and within said box a little Bible story plays out via a combination of ‘rod puppets‘ and ‘shadow puppets‘. We talk about obedience thru the story or Jonah, faith thru the story of Abraham, forgiveness thru the Parable of the Unmerciful Servant, and so on. Theo – Loving Obedience Trailer from Theo Presents on Vimeo. If you’ll notice, the Shoebox Bible Theater section was the bit in the middle. It’s very rudimentary, mechanical, and nuanced but by design. I wanted it to feel very… possible. I didn’t want to suspend reality I wanted to recreate reality ~~ as if there really were mechanical devices and that made things move like a cuckoo-clock and that there were really people underneath the stage manipulating the characters with push rods. And actually, what I thought was most novel about my creation didn’t make it to the final cut unfortunately enough. Originally I had it take place all in one ‘scene’ so to speak. I didn’t do traditional film cuts to different shots or locations but rather the whole ‘stage’ would quickly ‘collapse’ and ‘pop-up’ to change scenes, angles, or what have you in order to ‘cut’ to a different scene or ‘shot’. I nicked that idea from this wonderful video by the Super Furry Animals. Watching it might help explain what I mean. I had tinkered with digital characters/figures on push-rods on a few school projects as well as experimenting with old-fashioned styles in the digital realm so in a lull at work I made a little boat on waves animation with seagulls on strings, a bouncing buoy and dolphins on a pin wheel. The director liked it and suggested that perhaps I continue with what I was and tell the story of Jonah in that same manner ~ with strings and rods and flat scenery and so on. So I did. For the next 5 months I continued to work on telling this interesting story in this interesting little shoebox ~ no script, no storyboard ~ just me spending time with the story and trying to tell it in my stylized little way. Along the way it was said that my style had a very Mary Blair-esque feel to it. If it did, it was by accident as I’d never heard of Ms. Blair up to that point. Yet after I became acquainted with her work, along with the fantastic work of Eyvind Earle, I’d wondered where on earth they’d been all my life and I would refer to their works often for inspiration. I still do. By the time I’d nearly finished it, the director enjoyed it enough and visitors who came in and out of the studio really enjoyed its novelty so then it was decided then that we give this Shoebox a little more attention. Mind you, this was in 2007, before the cartoon series Theo’ was put in production so there was no grander context to put it in. So at first Shoebox Bible Theatre was envisioned to be a stand-alone product. The director, also a writer, wrote a narrative script after the finished product ~ almost like a composer would compose a score to a finished film. Do not take note a this is a most backward way to do things but the as whole genesis of the project was so impromptu, outside of redoing the entire animation again to fit a script, it simply just had to be done that way. But come to think of it, it’s in line with how silent films were made~~or at least how Buster Keaton’s silent films were made; on the fly, off the cuff; a loose idea rather than a tight script and they figured out what the title cards would say after the fact. Taking it one step further in this direction, I originally tried to tell the story in such a completely visual way ~ out of necessity ~ as there was no script, no dialogue to speak of (no pun intended). Theo – Saving Faith Trailer from Theo Presents on Vimeo. Now having to produce a dozen episodes in a short amount of time, my department of one doubled in size and now there’s two of us working on, and almost finished with, the Shoebox Bible Theatre portion. I’ve been fortunate enough to be able to design each episode. Every character, background, every prop, every everything. I’ve also been fortunate to work with the venerable animation veteran John Pomeroy on storyboards and layouts (since our 5th episode, “The Armor of God”). I no longer animate each episode as I’d never be able to keep up with the production schedule so while I’m designing all episodes, I’m now animating about every other one and my associate in the department is animating the alternate episodes. I’ve been able to shave the process down from 5 to 6 months per episode to 2½ to 3½ months per episode, form start to finish. To demonstrate how it’s done, I’ll take you through the creation of just one character. I’ll use the main character from the upcoming episode on redemption. The first step is of course the designing stage. For main characters I’ll usually sketch them out on paper first and work out them out outside of the computer. Once they’re approved by the director I move to the next step. Next I’ll design the character that you’ll actually see on screen. I design it in Adobe Illustrator. As I’ve become more proficient in Illustrator I’ll often times design ideas right in Adobe Illustrator rather than on pencil and paper. It’s not that I skip a step but rather I just do digitally what I used to do on a piece of paper. Once the design is complete in Illustrator I will break it apart into as many moving pieces as I’ll need to animate the character. If I need to animate eyebrows then each eyebrow will be on its own layer. If I need to animate an arm or a neck then each of those will go on its own layer as well. So in the picture above I’ve broken up all the elements I want to animate. This particular character in this pose has over 20 layers (some not shown here). That’s 20 different animateable elements for just this one character in just this one angle! Next I take in all of those layers into Adobe Photoshop. There I organize the layers and piece the character back together, yet the layers are still retained. The eyebrows, the neck, the legs, the feet, the torso, etc… ~ all the elements are still on their own layers. In Photoshop I rasterize the image and every single piece gets a unique, very subtle texture as seen in the detail to the left of the character. I try to keep the textures barely perceptible ~ to be “felt” rather than “seen” my director will often say. At this point I’ll also paint on shadows to make the character look ‘deep’ ~~ as if it’s made of many more layers than it actually is. For instance, if you look at the torso of that character above it looks as if it’s made from at least three different layers: a cyan outer garment, a pinkish under garment and a raspberry color sash when in fact it is just made of one layer with different textures assigned to each article of cloth I wanted to suggest. All that is just prep and setup. Now the fun part comes ~ I bring it into Adobe After Effects and it’s ready to animate. I join or ‘parent’ all the different layers together like a puppet. For instance the hands are connected to the forearms. The forearms are connected to the biceps. The biceps are connected to the torso. Each item is joined to the appropriate piece and from there I can set up keyframes and then animate the character. I also set up lights and different cameras in each scene. Tho I can move a camera in 3D space within After Effects, it’s not true 3D animation like Toy Story or Shrek. It’s what you’d is called 2.5-D. The characters do not become rounded. If I were to move the camera to the profile of this character I would not see the side of the character’s face but rather a paper-thin, one pixel wide layer…just as if it were a real shadow puppet. 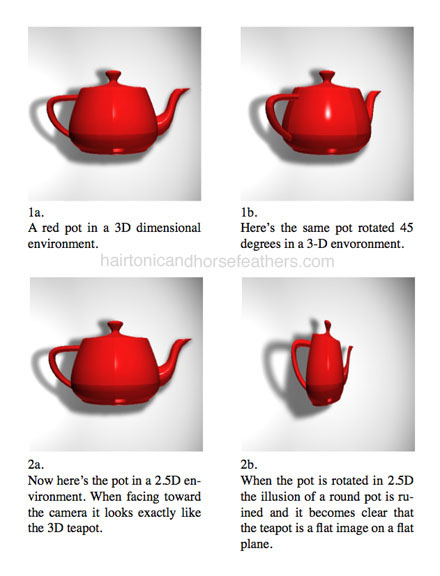 Here’s a small diagram I made to help explain the difference between 2.5D and 3D. Here’s a screenshot of our little character in context of the short film. In this scene she’s walking across a crowded marketplace with people buying and selling all around her and a slave market in the background. Every prop, every background character, every piece of scenery went through the same process as described above. When it’s all added up scenes typically consist of sever hundred layers and each episode contains several thousand to tens-of-thousands of keyframes. Once animation starts and you start building up keyframes is where it can get overwhelming. Below is a screenshot taken from another episode. It is 28 seconds worth of animation of a 31 layer character. 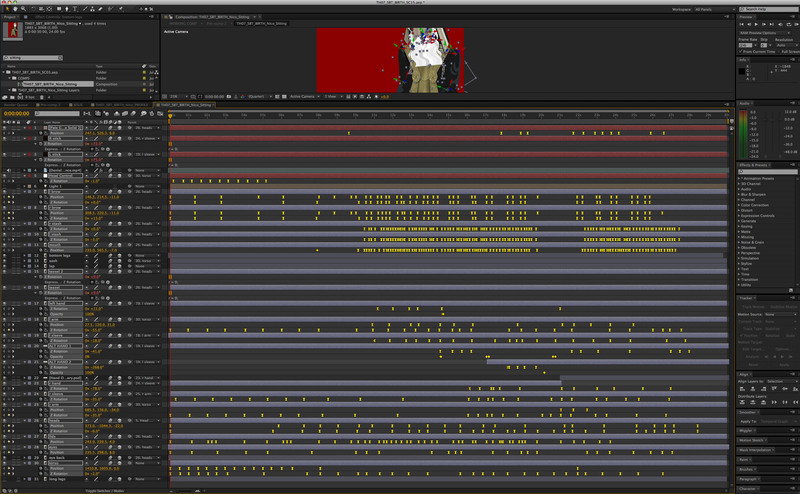 Each yellow mark represents a keyframe ~ that is ~ a point in time where I’ve designated a certain object to be. Again, each character, be it a background or main character goes through this entire process. Now, having written down how it gets done it’s become amazing to me that it even gets done. So~ if you are interested, thank you for being interested in I’m doing and just exactly how I’m doing it. Feel free to leave a comment if you’ve enjoyed the blog thus far. OMG, no way, OMG. I get it but, man that’s a lot of work. Awesome. Glad you enjoy it ~ and you’re right, it’s a ton of work tho it never strikes me of how much work until I stop and look back. Between the 2 of us working on it, we’ve done 10 so far and working on the 11th!